On Facebook, The "Republican Thinker" came out with a tried and true way to determine if you are a liberal with one of the funniest and truest cartoons I have seen. So, for those of you who are not sure how you stand on the political spectrum, use the following as a guide to determine if you are an ideological liberal. If you do get more upset with Fox News than you do the terrorist acts of ISIS well at least you now know where you stand on the political spectrum, and you probably are hating this post. 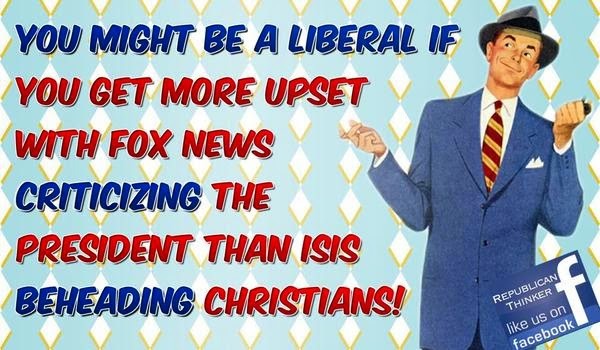 Now if you get more upset with ISIS than with Fox News than I salute you as a sensible patriot. You might want to "like" the Republican Thinker on Facebook by clicking here.